Glendale’s new green bike lanes on Sonora Avenue. Photo by Joe Linton/Streetsblog L.A. 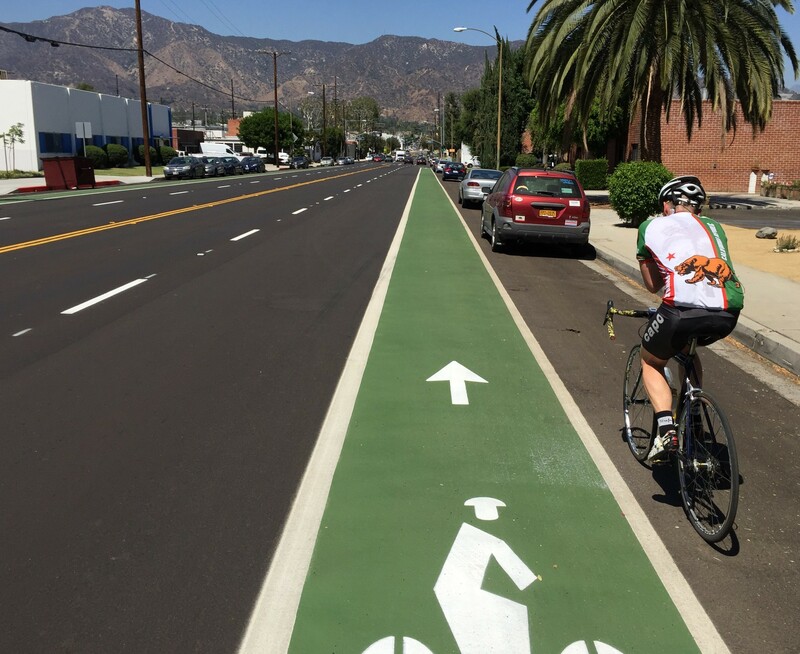 The city of Glendale recently completed installation of green pavement bike lanes on Sonora Avenue. These are the first green bike lanes in Glendale. Glendale’s new green lanes run 1.3 miles from Garden Street to Glenoaks Boulevard. On the north end, the Sonora lanes connect with existing bike lanes on Glenoaks Boulevard. On the south end, the facility ends near Griffith Park’s Bette Davis Picnic Area, with connections to both Glendale’s and the city of Los Angeles’ L.A. River bike paths. The city of L.A.’s river bike path in that vicinity is unfortunately temporarily closed due to construction projects on the 5 Freeway and the Riverside Drive Bridge. Detour signage routes cyclists onto the parallel Zoo Drive bike lanes in Griffith Park. Sonora’s new bike lanes are part of a suite of bicycle and pedestrian enhancements currently being implemented on Glendale Streets. The work program was approved by the Glendale City Council in February, 2016. The program improvements consist of primarily low-hanging fruit – projects that are easily implemented because they do not remove lanes from drivers. 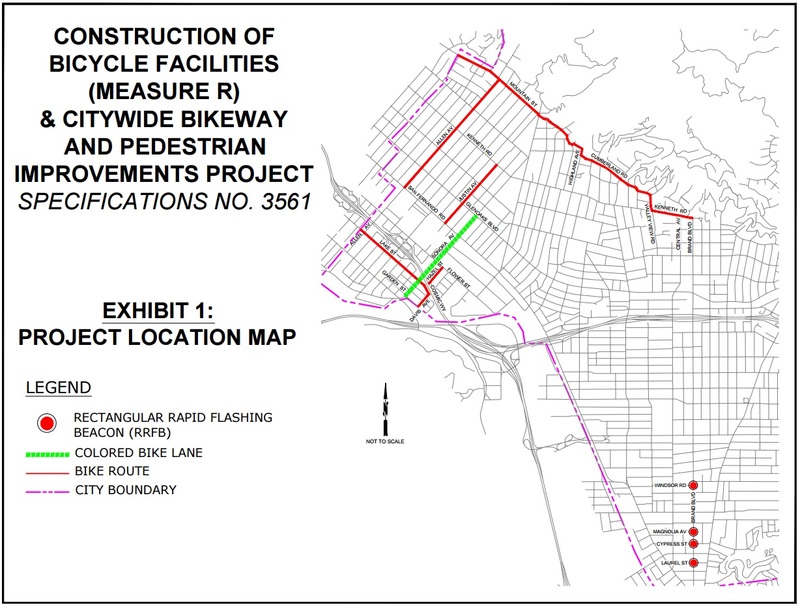 The bike projects include mostly sharrowed bike routes, with the only new bike lanes on Sonora Avenue. The pedestrian projects include new curb ramps and new high visibility Rectangular Rapid Flashing Beacons. See the full construction project list at the city of Glendale website. The freshly painted Sonora Avenue bike lanes are pleasantly highly-visible. They narrow existing car lanes, which should result in greater safety through reduced car speeds and better car positioning. At some intersections, the green lanes end and are replaced by sharrows. At some intersections, Glendale’s Sonora Avenue bike lanes give way to sharrows. Photo by Joe Linton/Streetsblog L.A. Though these are the first green bike lanes in the city of Glendale, green pavement (often tagged as #freshkermit) is already in place in numerous Southern California cities. The city of L.A. premiered green bike lanes in downtown and Boyle Heights in late 2011. The cities of Santa Monica, Lancaster, Long Beach, and others have implemented plenty of green pavement facilities for bicyclist safety and visibility.